My first tattoo - a red and black yin-yang symbol with a Pisces symbol underneath. I chose it to represent balance through changes. Plus, I'm a Pisces, for what that's worth. This tattoo is on my left upper arm. My third tattoo - a Haida Indian hawk design. I chose it to honour our First Nations people, and because I thought the design was beautiful. This tattoo is on my left shoulderblade. My second tattoo - a Chinese dragon. I chose this to honour my city's Chinese community, and to represent good luck. This tattoo is on the slope of my right breast. 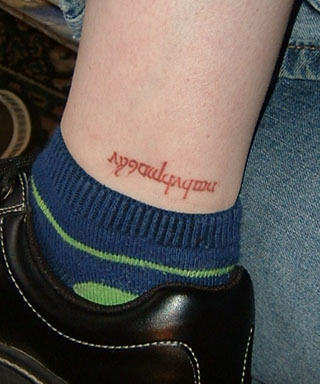 My fourth tattoo - my Elvish name in Tengwar runes. To celebrate my 33rd birthday and my rediscovery of J.R.R. Tolkien's works. My name in Elvish is Luinfalathiel, which means "daughter of the blue coast". This tattoo is on the inside of my right ankle.